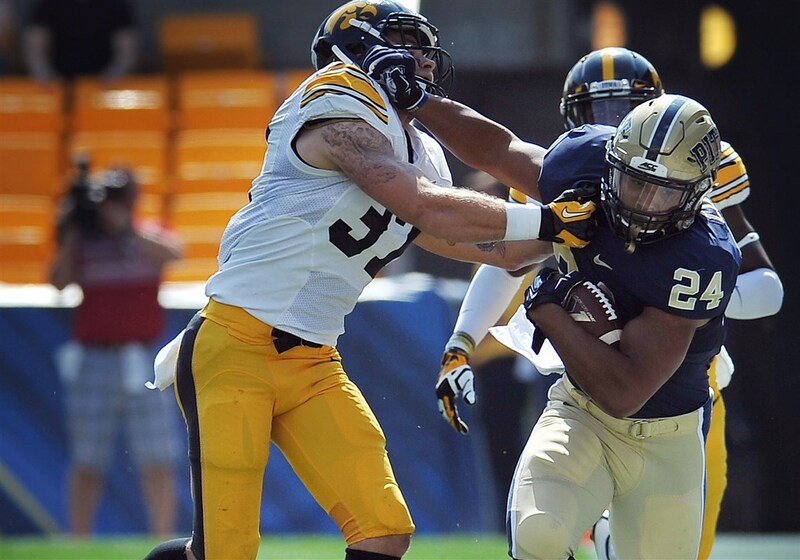 Why Pitt Standout James Conner’s Impact with Steelers Could Come Sooner than You Think…. That quote was from me to my brother last week, shortly after the Steelers selected Pitt running back James Conner with their compensatory third-round pick in the 2017 NFL Draft. Obviously, being from Pittsburgh and a huge fan of the University of Pittsburgh, my opinion about James Conner may be partially due to homerism. After all, leading up to the draft, how many football fans expressed a desire for their favorite pro team to draft a player from their favorite college team? But I wasn’t the only one who reacted joyfully to the news that Conner’s college home stadium–Heinz Field–would turn into his professional home stadium. First, who doesn’t love everything about James Conner? After rushing for 1,759 yards in his sophomore year of 2014, Conner was named the ACC Player of the Year. But just when it appeared that Conner was headed for greatness, he received a double punch to the gut. The first punch was a torn MCL, which he sustained in the 2015 season opener. The second, more devastating strike occurred many months later, when Conner was diagnosed with Hodgkin’s Lymphoma, a form of cancer that was discovered by doctors while he was undergoing rehab for his injured knee. You know the story by now: Conner absorbed both punches and kept on fighting. By May of 2016, he was declared cancer-free; and in his final season at Pitt, he rushed for 1,092 yards on 216 attempts. Obviously, less than a year after the physical toll that chemo and the MCL tear took on his body, the burst and explosiveness weren’t quite the same. It’s impossible to know where James Conner would have been drafted without those setbacks, but he was selected high enough that he’ll be given much more than a puncher’s chance to have a decent career with the Steelers. And why does it have to be just decent? I realize Le’Veon Bell, and his current status as the NFL’s best running back is one reason James Conner may never get to truly make his mark at the professional level. Another reason is obviously the knee injury. But when James Conner lines up in the offensive backfield this season, he won’t be the only Steelers running back who suffered a torn MCL at Heinz Field in 2015. Le’Veon Bell sustained that very same injury in Week 8 against the Bengals and was done for the year. Which brings me back to the chance James Conner might get to make a difference for the Steelers sooner than people think. For anyone to examine the Steelers top four picks, which also include linebacker T.J. Watt, receiver JuJu Smith-Schuster and cornerback Cameron Sutton and wonder if they will be able to help them in their rookie seasons may have forgotten about the depth issues the team has faced in recent years. And that’s especially been the case at the running back spot, where Le’Veon Bell, despite his all-world talents and tremendous production, has missed a total of 17 games due to either injuries or suspensions over his first four seasons. As for the postseason, the 2016 edition was the first Le’Veon Bell was actually healthy at the start of. And while he did set franchise records by rushing for a combined 337 yards in back-to-back victories over the Dolphins and Chiefs, he was limited in the AFC title game versus the Patriots after aggravating a groin injury he reportedly had been nursing for a couple of weeks. Unlike the torn MCL Le’Veon Bell suffered in 2015 or the hyper-extended knee he sustained at the end of the 2014 season (both occurring after questionable tackles in games against the Bengals), it could be argued that an injured groin for a running back is a symptom of overuse. Maybe it is. Maybe it isn’t. But the one thing that is certain is that Pittsburgh has been limited at the running back spot in each of the past three postseasons. You know what they say about not learning from history. Therefore, while it would be foolish to think James Conner is going to get any greater workload than what LeGarrette Blount and DeAngelo Williams both received while playing behind a healthy Le’Veon Bell in the past, it would also be foolish to assume he won’t be called upon to help the Steelers in 2017. If the Steelers truly believe Bell’s injury, which required surgical repair in March, was caused by overuse, they might already be thinking about lightening the star running back’s load–even if it’s just a few less carries a game. If the Steelers are forced to turn to James Conner for one reason or another, what kind of running back will they be getting? That’s hard to predict. Obviously, like every other draft prospect, Conner has his weaknesses, which, according to his NFL.com draft profile, include average lateral movement and a lack of elite speed. But then again, those were some of the same criticisms Bell had to overcome coming out of college–and that was before he suffered a torn MCL. Despite his maturity issues that have led to two drug-related suspensions, Le’Veon Bell is a hard worker and has certainly gotten the most out of his abilities. If there was a do-over of the 2013 NFL Draft, instead of lasting until the second round, No. 26 would be a top-10 selection. Will James Conner have a chance to get the most out of his abilities in Pittsburgh? There’s no doubt he’s a hard worker, willing to do whatever it takes to succeed. As per Kevin Colbert in his post-draft media appearances, Conner has a great opportunity to make a name for himself on special teams. 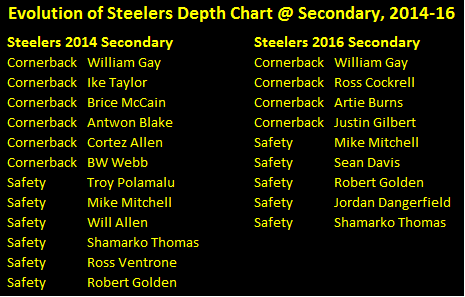 As for moving up the running back depth chart, James Conner obviously has to develop an all-around game that includes being a reviving target for Ben Roethlisberger out of the backfield and picking up the blitz (two things Bell also excels at, which is why he never comes off the field). The sooner James Conner improves in areas besides just running the ball, the quicker he’ll distance himself from the likes of Knile Davis and Fitzgerald Toussaint, which shouldn’t pose too great a challenge. What about the very top of the running back depth chart? As it stands right now, why would anyone want to mess with what Le’Veon Bell is doing? The answer is, nobody would. But in addition to his injury history and suspension issues, there could be contractual issues with Le’Veon Bell. Unless the two sides come to an agreement, Le’Veon Bell will play the 2017 season under the franchise tag. Sure, he will get paid rather handsomely, but he’s eventually going to want a multi-year deal that will annually pay him at least the $12 million he’ll earn next season. What happens if the two sides never agree on Le’Veon Bell’s worth? 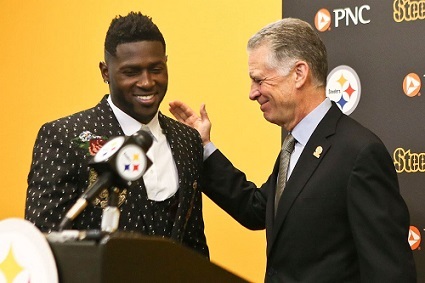 In a perfect world, Le’Veon Bell will ink a new deal and go on to have a Hall of Fame career, while James Conner develops as a player and bides his time in Pittsburgh for four years, before signing with another team looking for a featured running back. But this is not a perfect world, and that’s why James Conner’s impact with the Steelers could come a lot sooner than people think. Taken from the grade book of a teacher who shies away from grading on effort but sometimes just can’t help himself, here is the Pittsburgh Steelers Report Card for the Pittsburgh’s loss to the Patriots. Antonio Brown caught 7 passes for 106 yards despite suffering a quad injury late in the third quarter. He also ran for 13 yards on a reverse. Brown has been criticized for not making more effort on the interception in the end zone, although replays show that Malcolm Butler had pretty good positioning. Darrius Heyward-Bey had one excellent touchdown catch and another excellent touchdown catch and run that was negated by a questionable penalty. He was also penalized twice for offensive pass interference – both were questionable calls. Cobi Hamilton had 3 catches on 6 targets and if he continues to play at this level the Steelers may have difficulty putting him on the practice squad. Sammie Coates had one catch for four yards. The Steelers gave up one long punt return, but Steven Johnson negated that, and Greg Warren made a heads up play in recovering it that could have changed the course of the game. New England got no where on its single kick return. In contrast, Fitzgerald Toussanit and Justin Gilbert both made solid kick returns. While those positives are real, the special teams grade must reflect Chris Boswell’s 3/5 on field goals. In all fairness to Chris Boswell, the wind was clearly a factor at Heinz Field and had he made his last kick, it would have set the record. But his first missed kick of 42 yards should have been made. Two successful kicks would have dramatically altered the game’s dynamic. You do not contest a game against New England Patriots deep into the third quarter and come within 11 points of winning as short handed as the Pittsburgh Steelers were without good preparation. 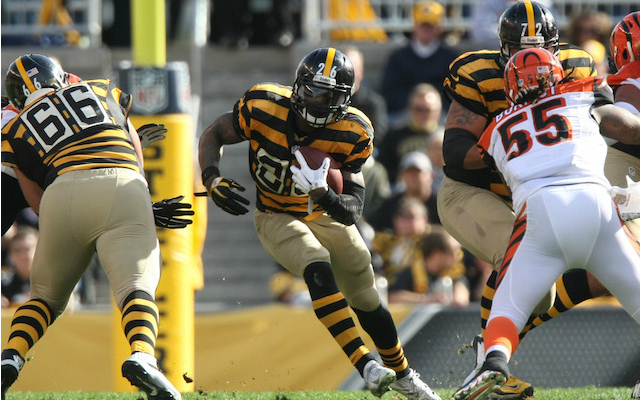 Todd Haley’s game plan figured to lean heavily on Le’Veon Bell, and he did not disappoint. However, the Patriots, as expected, loaded the box, and Haley was ready to take advantage. Credit both Haley and Jones for finding a way to get Antonio Brown the ball. Mike Munchak also deserves credit for preparing his offensive line, and giving Landry Jones the time he needed to throw. Keith Butler also deserves credit for his part in ensuring the Steelers were competitive. Yes, the Steelers defense failed to contain Rob Gronkowski when it counted. Yes, they gave up far too many rushing yards. But they also forced the Patriots to punt five times, and forced a number of three and outs. At the end of the day, it wasn’t enough. The Steelers still missed too many tackles and failed to get pressure on Brady save for the first series of the second half. Mike Tomlin’s pregame planning and assessment was right. The Steelers couldn’t rely on Landry Jones to win the game for them, and they’re game plan reflected that. When the Steelers performed well, their focus was evident. Still, too many penalties and too many missed opportunities took their toll. To win this game, the Steelers needed to stay on edge from start to finish, and too many times they fell off that edge. Early on, VERY early on, their was one player who clearly showed up with an intention of winning this game. This player showed that by forcing a fumble on the Patriots first play from scrimmage, making a beautiful tackle from behind the line of scrimmage, and by flying around all over the field. While his game wasn’t flawless, Jarvis Jones set the tone early for the Steelers and for that he wins the Unsung Hero Award. The Pittsburgh Steelers star running back Le’Veon Bell has lost the appeal of his failed drug test, and will be suspended for the first three games of the Steelers 2016 season. Le’Veon Bell first ran afoul of the NFL’s substance abuse policies in July of 2013 when he an LeGarrettee Blount were caught driving while smoking marijuana. The NFL initially suspended Bell for 4 games, a suspension which was later reduced to 2. Since then Bell has said all of the right things, and was even offered up as an example for Martavis Bryant, who is struggling with marijuana addiction. When Steelers OTA’s began, Le’Veon Bell assured reporters he would be ready for Pittsburgh’s season opener the focus was on the recovery from the knee injury he suffered at the hands of Cincinnati Bengals thug linebacker Vontaze Burfict in the Steelers loss to the Bengals at Heinz Field last fall. Given that the source of the rumors was sports shock jock Mark Madden – the same Mark Madden who once labeled Ike Taylor as the “Steeler worst 4th round pick ever – and give that Bell vehemently denied the rumors, the story died. Until Steelers training camp began, and word leaked that Bell was in fact facing a four game suspension for skipping drug tests. Bell did not disucss the incident much during preseason, although there were indications that the Steelers felt confident he might win his appeal. We are disappointed Le’Veon Bell has been suspended three games to start the 2016 season. We will continue to support Le’Veon, but we acknowledge this mistake has put the team in an unfortunate position. We will continue to work with Le’Veon to help him eliminate distractions in his life so he can reach his full potential as a member of our community as well as a player for the Pittsburgh Steelers. In a video posted on Twitter, Bell sought to explain the situation to fans, although that video has since been deleted. Staying in the same stage of the program means Le'Veon Bell's next suspension would also be four games, not 10. Decent deal for him. Getting his suspension reduced by 25% is a plus for both Bell and the Steelers, and Bell staying in the same stage of the NFL’s substance abuse policies is also important, as a further incident would only cost him four games, as opposed to 10. With Bell out for the Steelers matchups against the Washington Redskins, Cincinnati Bengals and Philadelphia Eagles, DeAngelo Williams will once again take the helm as the Steelers starting running back. However, Bell’s absence is a boon for Fitzgerald Toussaint and Daryl Richardson, both of whom are battling to be the Steelers number 3 running back. Both men have looked strong in training camp and in preseason and barring injury or a complete meltdown during the Steelers remaining two preseason games, should make the opening day roster. It is believe that the Steelers will not carry more than three running backs, plus Roosevelt Nix, on their active roster once Bell returns to the team. However, both men will have a chance to prove they belong between now and then. The Super Bowl-expectations are high this year for the Pittsburgh Steelers, but unfortunately, those expectations may have to be tempered just a bit. According to ESPN.com’s Dan Graziano, his sources have told him that star running back Le’Veon Bell is facing a four-game suspension to start the 2016 season for missing a mandatory drug test. Le’Veon Bell, 24, was suspended for the first two games of the 2015 season, stemming from a DUI charge in August of 2014, when a vehicle he was riding in with former backup running back LeGarrette Blount was stopped by local police. The two were charged with marijuana possession, and Bell, who was the driver, was subsequently charged with a DUI. 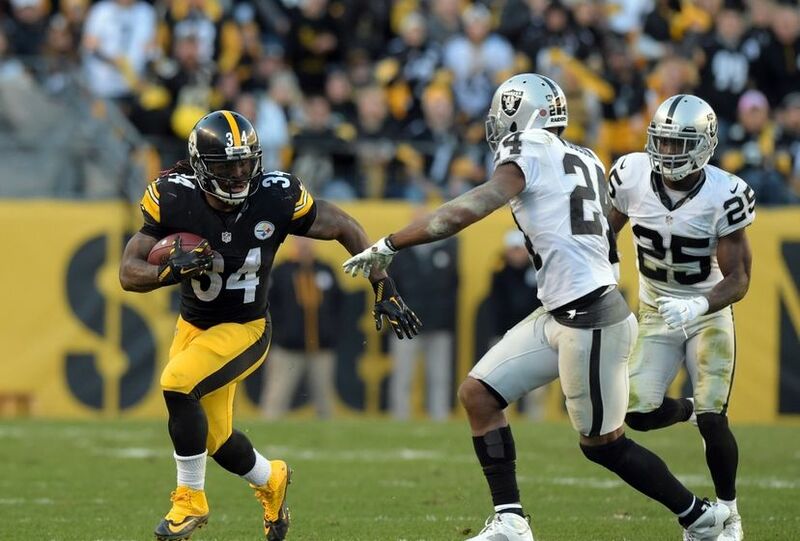 Bell was perhaps the most important cog in Todd Haley’s offensive game-plan in 2014, when he rushed for 1,361 yards and added another 854 yards through the air on 83 receptions. Sadly for the Steelers, Bell suffered a hyper-extended knee in a the regular season-finale against the Bengals at Heinz Field and was out for the wild card playoff game against Baltimore a week later. Last season, in-addition to his two-game suspension to start the season, Bell missed the final two months after suffering a torn MCL, once again at the hands of the Bengals in a Week 8 match-up at Heinz Field on November 1. 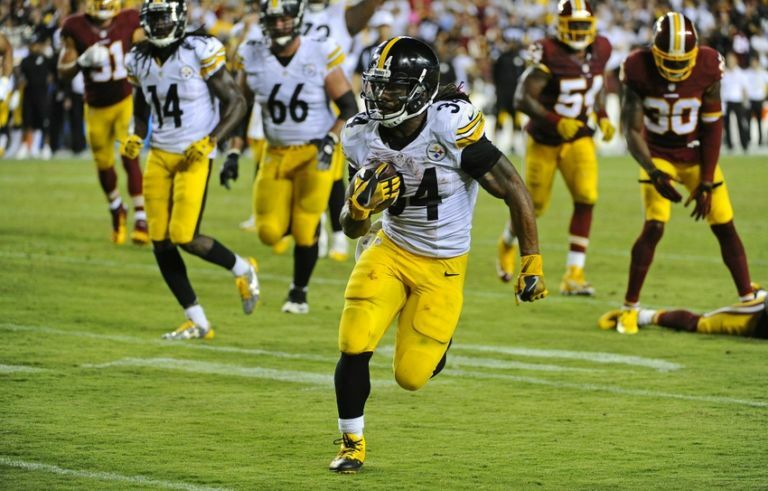 If the reports are true, and Bell is indeed out for the first month of the season, the Steelers will have to rely heavily on veteran running back DeAngelo Williams, who piled up 907 yards on the ground while filling in admirably for Bell a season ago. Behind Williams, the Steelers have Fitzgerald Toussaint. While fans remember Fitzgerald Toussaint for his fumble in the AFC Divisional loss to the Broncos, Toussaint played well overall for the Steelers in the playoffs. However, beyond Williams and Toussaint, the Steelers 2016 running back depth chat is thin. While the reports on Bell aren’t official just yet, it is factual that Martavis Bryant, who was suspended for the first four games a season ago for violating the NFL’s substance abuse policy, will miss all of 2016 after failing multiple drug tests earlier this offseason.